Wall Street is the financial district of New York City. It is named after the long street that stretches from Broadway to South Street in Manhattan. Over time the term has become a byword for the U.S. financial markets as a whole. Wall Street is home to the New York Stock Exchange. Wall Street is the headquarters of other major exchanges, including NASDAQ. Wall Street is one of the major financial centers worldwide. 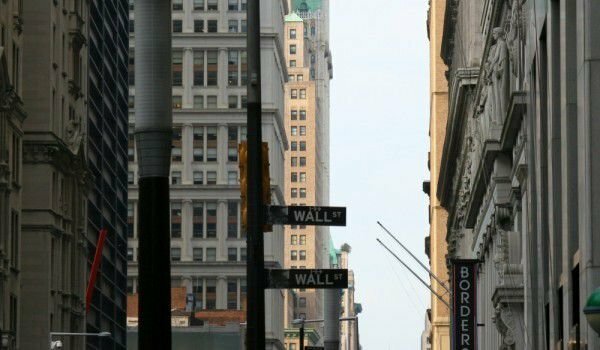 There are various theories about the origin of the name Wall Street. Initially it was a Dutch name and was known as de Waal Straat. The generally accepted version is that the street name is derived from the northern boundary New Amsterdam, built to protect against the English colonial encroachments and protection of Native American inhabitants. The controversial explanation is that Wall Street is named after the family Walloon, among the first settlers who came on a ship in 1624, there were thirty families, who wore a family Walloon. In 1640 the colony's inhabitants lived in wooden houses. After several years with the help of African slaves a fort was built with a serious wall. In 1699, it was destroyed. In the late eighteenth century at the foot of Wall Street there was a tree, around which traders and speculators would gather to trade securities. The advantage of this gathering was that people are in close proximity to each other. In 1792 a group of merchants signed up for Buttonwood, which laid the foundations of the New York Stock Exchange. The idea of the agreement was to make the market more structured and manipulative without auctions. Persons signatories agreed to trade with one another at standard rates, and those who are not signatories had to pay a higher commission for transactions. In 1789, Wall Street became the scene of the first inauguration of U.S. president George Washington, who was sworn in on the balcony of Federal Hall on April 30, 1789. In the first few decades of the nineteenth century the region had emerged as a residential and business structure. Office buildings, however, prevailed. In the early nineteenth century, at the opening of the Erie channel, come a boom in business in New York because it was the only major east port that had direct connection with the inland port to the Great Lakes . Wall Street turns into the money capital of the United States. In 1884, Charles Dow began to create a stock rating tracker, starting with eleven shares of railroads. When the average price jumped sharply, he called this bull market, and when we fall, he said it was a bearish market. Thus, he analyzed the market and stock prices, which became the accepted way to view the stock market. Architecture on Wall Street was created in the Golden Age style, although there are some impacts of the Art Deco style. The layout of the street does not follow the model of a rectangular grid, typical of Manhattan, and the small streets are not wide enough for movement. In the street rises one of the tallest buildings in the city, creating spectacular views of artificial canyons.